The ABEA is sponsored by The Society of Financial Professionals. The award was established to honor companies that demonstrate a firm commitment to ethical business practices in everyday operations, management philosophies and responses to crises or challenges. The application for this award is by nomination only. Toledo Metal Spinning Company was nominated for this award by Seymour & Associates of Maumee, Ohio. 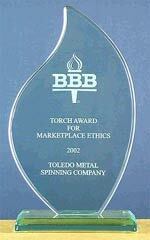 Toledo Metal Spinning Company is the only local winner of the American Business Ethics Award for the year 2000. Toledo Metal Spinning Company demonstrated firm ethical treatment of employees, customers and suppliers in the wake of the disastrous fire in February 1998.